Time. Time is one of a multitude of gifts given us by God; He loves it when we use it wisely! In one year, there are 8,765.82 hours. That averages out to 730.485 hours per month, and 168 hours per week. How many hours does one sleep? In an average lifespan (74.1 years), one sleeps around 194,821 hours. That’s 2,632.7 hours a year, and 219 hours per month. According to the “American Time Use Survey,” an average worker works 8.9 hours a day. You can figure the rest of the formula out for yourself. How much time (hours) do we offer to God? 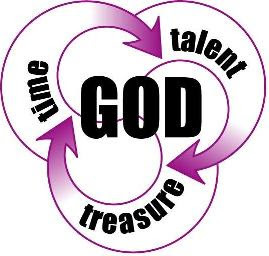 Let’s simplify things for a minute: out of the 168 hours in a week, how much “God time” do we usually give? For many, it will vary from week to week. For some, it may be more during times of joy and less in times of stress. How many hours to we give toward prayer? Bible reading? Helping our neighbor or community? How many hours to we offer to Christ’s Church? I’m proud to say that there are many who give a great number of hours during their work week for the betterment of God’s Kingdom. Reality shows, I’m afraid, that there’s also a contingent who don’t think much about God except that hour or so on Sunday mornings. Ouch! I like to think that our Sundays are set aside for holiness. The best way for me and Dr. Luther is to enter into worship in a church building where the Word of God is correctly preached and the sacraments are rightly administered. That simple practice helps set the stage for the whole week for me and my family! Soon we will move to a new schedule on the Sabbath. Thank you all for being understanding because of my family’s needs that will carry Mary Alice and me out of town for a while. This is the best schedule your leaders could come up with. I know it will be different for all to move to a different “time slot,” but join us for the coming Sundays (beginning September 18) and not only take that one hour out of the 168 for the week for worship, but consider an extra hour (again, out of that 168) and join us for Sunday School. (Rally Day is the 18th) We have the best Christian Education program around! And – Time and Talent forms will be going out soon. As you prayerfully ponder your commitments for 2017, think in terms of time that you might want to be willing to give – in service to Jesus Christ, His Church, and the community in which we live. Think and pray about this gift of time. Every hour counts. There’s work for God to be done! Join us, won’t you? …God loves you and so do we!